Real Temp is a lightweight computer software program for the Windows operating system that has been designed to provide the user with information about the temperature of Intel cpus. The software program supports Intel single Core, dual Core and quad Core processors and will display the processor temperature in real time in the application interface. It will also display the cpu temperatures in the Windows system tray after minimizing the program. Real Temp displays various information about the cpu. The information are not limited to the cpu temperatures but also the model of the cpu, clock speeds and cpu load. The main purpose of Real Temp is however cpu temperature monitoring. The temperatures of each cpu core are displayed in columns in the program's interface. They are divided into various sections that display the maximum and minimum temperatures as well as the current cpu temperature. The time that the maximum and minimum temperature levels were reached are also displayed in the program which is great for troubleshooting purposes. Many advanced settings are available that can change the information that are displayed, integrate external applications such as RivaTuner or settings that define how and where the application is displayed. The CPU temperature monitor Real Temp uses less than one Megabyte of computer memory when running minimized in the system tray. Computer users with Intel cpus might want to give the software program a try. Been using this for awhile now, If you go into the settings you can get it to show GPU temp too. 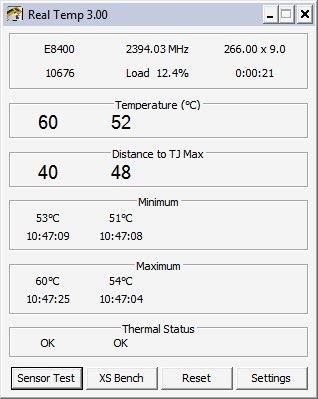 I have a E8400 @ 3.62 GHz and I think the temps are a bit high. My temps are mid/low 40c idle but can get near 70c load now it’s summer. I think I should get a better cooler! This screenshot is strange, Is it yours Martin? It must be hot country or really bad cooler to be at 60c near idle @ 2.39GHz, 266 x 9 ? 8c difference between cores too. Deano yes it is mine and it is high because I have the fan turned down to a minimum because I like my PC silent :) And it is damn hot here at the moment. “Processor not supported” message on a Dell Dimension E520. I’ve used Real Temp but I generally run Core temp. RT doesn’t seem to recognize that I am running overclocked (it shows 2400 MHz). I used to use Speed Fan but it proved to complex to figure out all the settings. Besides, the ABIT mobo has an app which allows me to easily adjust fan voltages. I run an ABIT IP35 Pro mobo with Intel E6750 overclocked to 3200MHz and 2GB of Corsair RAM overclocked to 1000 MHz (from 800MHz). CPU voltage (VCore) is bumped to 1.37V (from 1.30V) and RAM to 2.2V (from 1.80V). My CPU temp right now is 30°F with an ambient air temp of 72.2°F. I run a big CPU cooler (Enzotech w120mm fan) plus 5 case fans. On a really hot day, I can see my CPU temps go into the the low 40s°F. You guys with temps in the 50’s and 60’s F need more cooling! I think you have your temps wrong, that or you have the most amazing cooler known to man. Your CPU is below freezing! I think you meant to say your CPU is 30C and on a hot day low 40’s C. What do you get with that cooler with 100% CPU load? My CPU temp right now is 30°C with an ambient air temp of 22.3°C. I run a big CPU cooler (Enzotech w120mm fan) plus 5 case fans. On a really hot day, I can see my CPU temps go into the the low 40s°F. As to your question about 100% load, I tested under full load some time ago and got into the the mid 50°C’s if I remember correctly. But since I don’t run anything CPU intensive, this metric is meaningless to me. I’ve also noticed that cleaning the dust off everything now and then can be good for minus 2-4°C temp difference.